Many moons ago my grandmother presented me with a stack of old Nancy Drew mysteries that had been sitting on a bookshelf in her house. 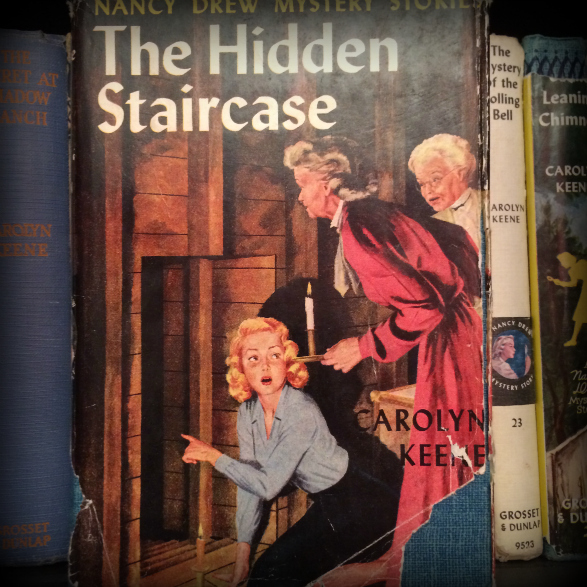 I selected The Hidden Staircase to read first, and my love of a good mystery was born. Over the years I have gravitated towards reading mystery series. When I find a great cast of characters, I enjoy their continuing character and relationship development as the series progresses. An always expanding list, here are some of my favorite series recommendations. While the bulk of my reading falls into the mystery genre – including cozy, thriller, and classic who-done-it? – now and again a non-mystery selection pops into my reading pile. I hope to use this blog to help mystery lovers like myself discover a great new book or two. How do you live in a world where your dad no longer exists? I remember reading the Nancy Drews as a young girl. Good stuff. Wow!! Thanks so much Erika! That is awesome! Erika, thanks for stopping by Puddletown and choosing to follow my blog. I loved Nancy Drew and I’ve recently found Maisie Dobbs and am enjoying reading some of those. I like your choice of theme; it’s the one I chose for my writing blog at http://sherreymeyer.com. Clean and crisp. Good for writers and readers! But I’m always wanting a change of scenery on my blog so who knows! For some reason, I don’t think I’ve ever saw your reply! It’s a pleasure, thanks for following me as well! Hi again, Kristi! I’ve nominated you for the Versatile Blogger Award! You can find more information here: https://xingsings.wordpress.com/2015/05/14/versatile-blogger-award/ Have an awesome day! Thanks Erika!! I really appreciate it! May I say that I just love your blog. I know I will! 🙂 Thanks for the follow. Why thanks for that vote of confidence.